The cover of Chance's new single. If you went to bed early last night you might have since woken up to "Angels," a new song from Chance the Rapper. 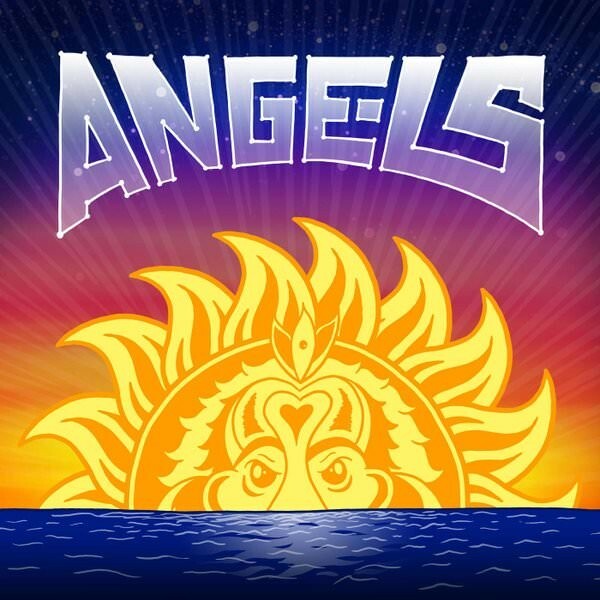 Those of you who were staying up until dawn surfing the web (or watching The Late Show With Stephen Colbert) could have easily heard "Angels" before falling asleep, and maybe the song's bright, gleeful energy was the perfect soundtrack for the sunrise. I certainly felt that way after I dashed to grab "Angels," which, like May's Surf—an album by Chance's band, the Social Experiment, and its leader, Nico Segal, aka Donnie Trumpet—was immediately available for a free download on iTunes. Unlike Surf Chance has taken the lead on this one. It's his first new song since he recently began talking about releasing a third solo mixtape, part of a trilogy that tops off #10Day and his breakthrough Acid Rap (though it's part of a steady stream of material on which he's appeared). Barely a week ago Chance shared the mike with singer Tinashe on an alternately euphoric and glum track from London producers Snakehips called "All My Friends," and the grain of the MC's voice and his pivoting flow evoke all the mixed feelings of spending one too many hours in a club you don't particularly like with friends you love. Snakehips's light hand with the production—the drooping vocal samples, the drum loop that moves with a slight stumble, the honeyed pipe organs that stick to the fringe—leave plenty of space for listeners to insert their own emotional energy. Concision is part of what helps "All My Friends" rocket skywards, and it's also part of what makes Chance's "Angels" feel like it's constantly floating in the air. In fewer than three and a half minutes Chance, Pivot Gang rapper Saba, and the Social Experiment tap a spectrum of emotions—elation, sorrow, pride, and a twinge of nostalgia, among others—while riding a sunburst of melting vocal samples, buoyant horns, airy keys, and light steel drums that sound like they leaped over to "Angels" from a bop track. "Angels" moves like a pop song stuck on the rotation for Top 40 radio stations, even as it portrays raw and heavy details of Chance and his life in Chicago. Chance's best songs contain volumes of specifics from his personal life and surroundings—it's almost like he sweeps a commercial fisherman's net on top of his memories—and "Angels" is no different. He raps about generations of his family—from his grandmother to his newborn daughter—while keeping his city close to his heart, alluding to the emotional damage of gun violence ("There's too many young angels on the south side / Got us scared to let our grandmamas outside"). And though he's on track to be a crossover star Chance raps about his considerable accomplishments with the wide-eyed wonder of one of his fans. Early in the track he raps, "This is what it sounds like when God split an atom with me / I even had Steve giving out apples for free," an indication that releasing free music through a monolithic digital retailer seemed like an impossible feat to achieve. He raps about it with both a sense of pride and the awe his fans reserve for him—his fans talk about him like he's a superstar, and part of Chance's success is due to a nuanced understanding of what it's like to be a fan stoked on every new drop. Chance's Late Show performance, like "Angels," was filled with personality and blissfully carefree in execution. DJ Oreo flipped onto the screen and showed off the footwork skills he honed as a member of dance collective Heat Squad while in high school. Bop king Dlow joined Oreo, Chance, and Saba to pull off coordinated moves that touched on footwork, bop, and hitting the zan—all movements Chance and company have busted out onstage before. Saba and Chance wore hoodies for WGCI and Power 92, respectively, two local radio stations Chance references on "Angels." Like every other Late Show episode, the performance was taped at the Ed Sullivan Theatre in New York City, but it felt like it could've been an impromptu dance party in a Chicago backyard. Saba's face couldn't contain his smile, and I found it hard to hold back mine. Last month's flood of Chicago hip-hop releases ranged far and wide, and the Era and Lud Foe show two very different directions the music can go. Jumbled, half-formed, and oddly engrossing, Kanye's seventh album mirrors his public ups and downs. Today's 12 O'Clock Track is the latest single from the MC's forthcoming album, In My Mind. Mentor to a generation of local MCs that includes Chance the Rapper, Saba, and Mick Jenkins, poet and educator Mike Hawkins passed away at age 38. With a shout-out from Chance the Rapper and an upcoming remix from Chief Keef, local rapper DJ Nate is worlds away from his days as a heavy hitter in the juke scene.